Roasting lackluster winter vegetables enhances their flavor, and tossing them with an herb-packed vinaigrette takes them to a new level. Rosemary, oregano, thyme and red wine vinegar bring the flavors of Greece to your table without leaving home. This recipe makes a delicious side dish, but you can easily transform it into a heartier meal by adding chicken, lamb or shrimp. Serve over a bed of lettuce for a light lunch, or turn it into a more filling salad by placing the hot vegetables over raw spinach to wilt the greens. Add a can of cannellini beans for additional heft. These roasted vegetables are also fantastic over pasta or crostini, or tossed with grains such as farro or quinoa. 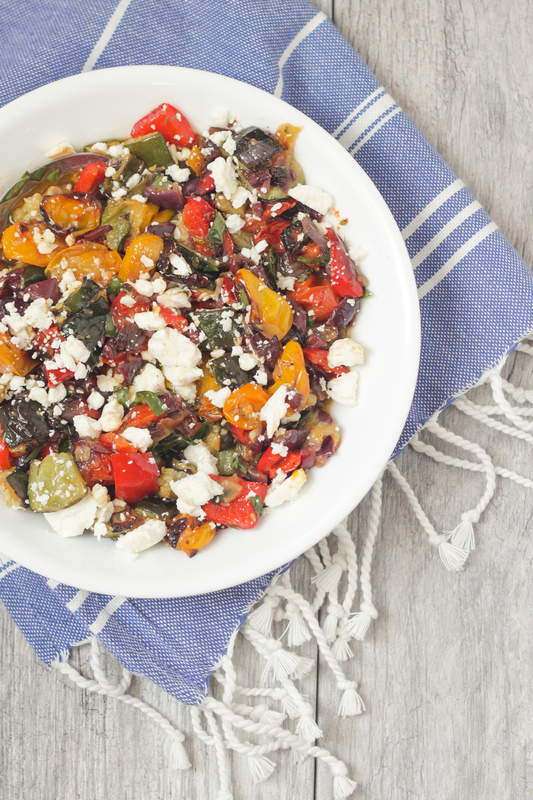 Roasted Greek vegetables are a perfect way to transform lackluster winter vegetables or use up a bumper crop of summer produce. Use the vinaigrette within 1 day of making, or the dried herbs will impart some bitterness to the dressing. Preheat oven to 450° and place the vegetables in a medium bowl. Add olive oil, salt and pepper and toss to combine (use less salt than normal, since the feta and kalamata olives we’ll add at the end are salty). Spread mixture in a large rimmed baking sheet. Set aside the bowl for later use. Bake 25-35 minutes or until vegetables are soft and have some charred parts. Halfway through roasting, shake the pan to loosen or flip the veggies using a large spatula. While the vegetables are roasting, make the dressing. Combine all of the vinaigrette ingredients in a jar and shake well to emulsify. Once vegetables are done cooking, remove the pan from oven and let cool. Return vegetable to the mixing bowl, add olives and vinaigrette. Toss to coat. Sprinkle with crumbled feta cheese and serve.